About a year ago I retired most of my computers, and am now left with only two: Loka, my old desktop (now with a new 23″ screen), and Savitar, a Thinkpad X41 I bought about 18 months ago. Both computers run Debian Testing. My main desktop environments and window managers on Loka have been Xfce with Openbox and WindowMaker, which I rediscovered this year. On Savitar, I used only Openbox and Awesome. Xfce 4.6 with Openbox, using the Alghattas Openbox and Gtk theme, and the Elementary icons. 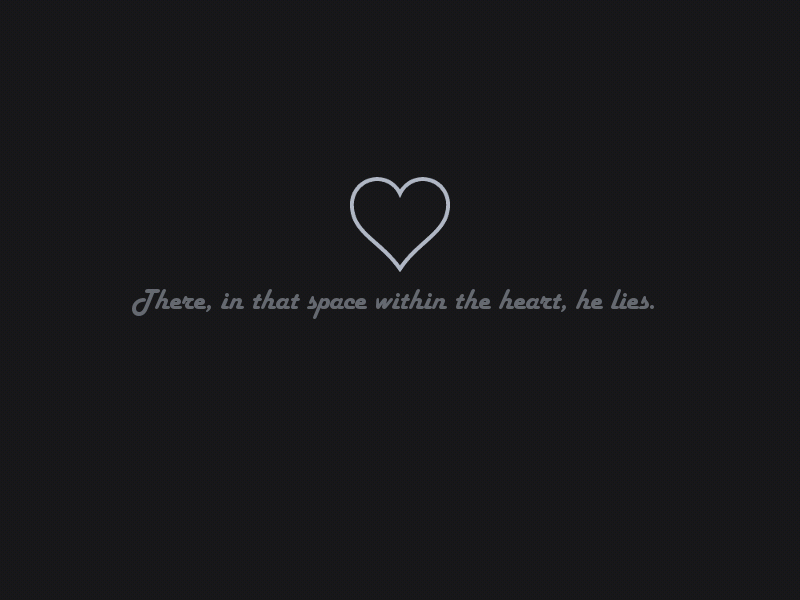 I don’t remember where I found the wallpaper. Xfce 4.6 with Openbox, using the Alghattas Openbox and Gtk theme, the Elementary icons, and this wallpaper. 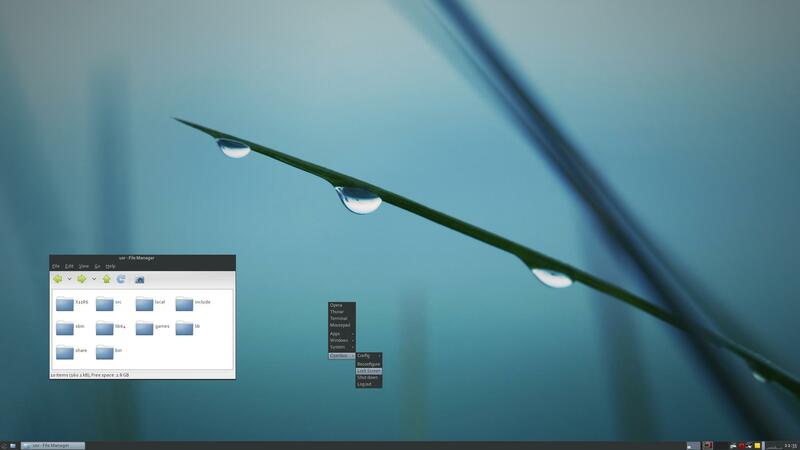 Xfce 4.8 with Openbox, using the Erthe Openbox and Gtk theme, the AnyColorYouLike icons, and part of this image as wallpaper. 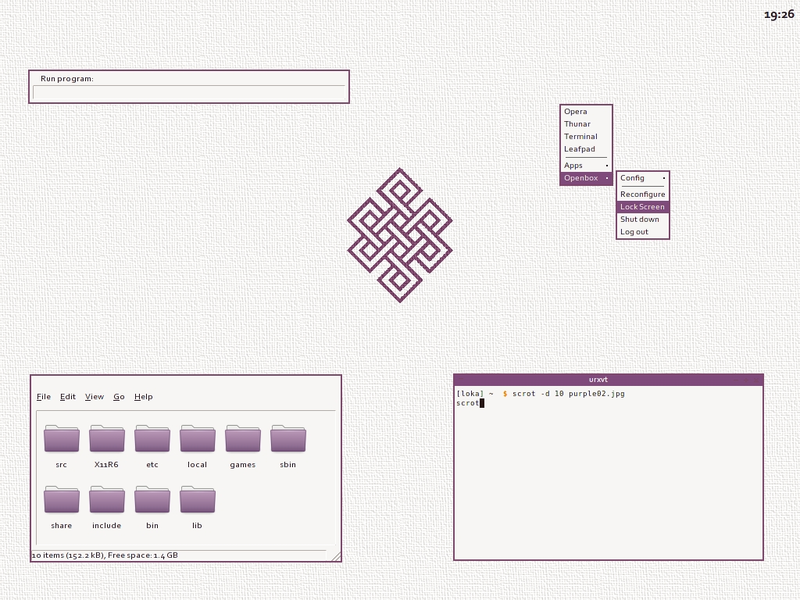 Xfce 4.8 with Openbox, using the Erthe Openbox and Gtk theme, and the AnyColorYouLike icons. 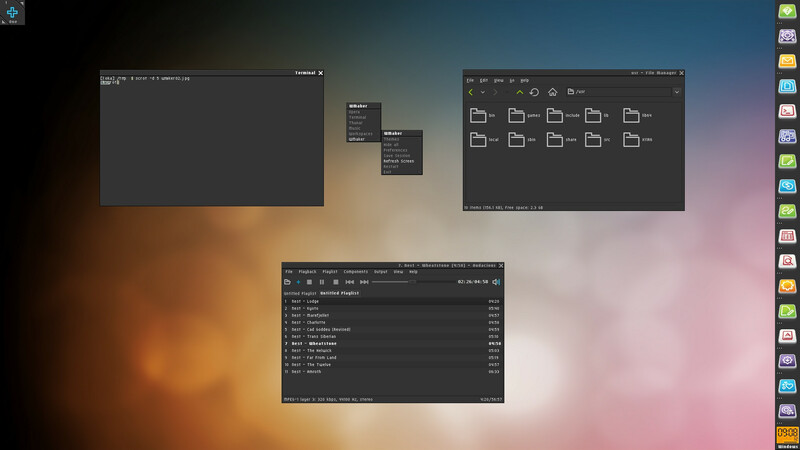 WindowMaker, with the ShikiBlack WindowMaker theme, the Shiki-JetBlack Gtk theme, and the Moblin icons. I don’t remember where I found the wallpaper. 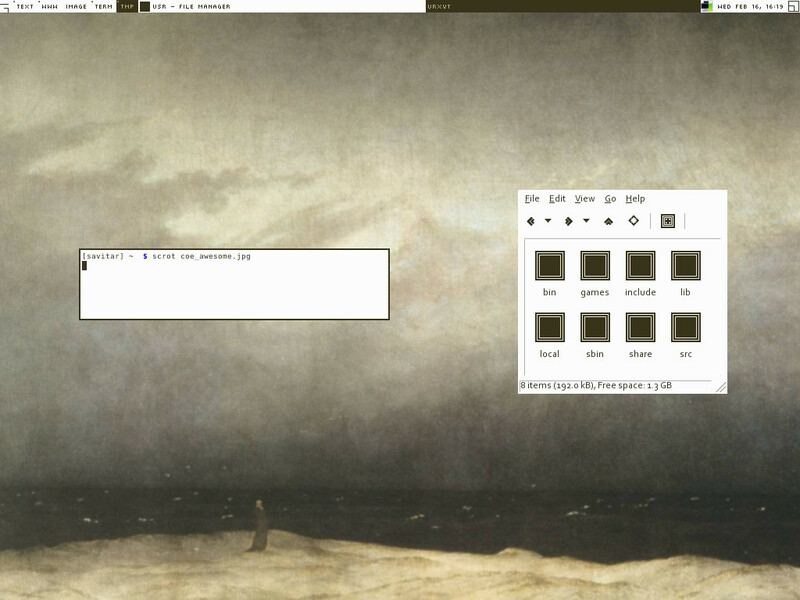 Awesome, with the Children of the Earth Awesome theme, Gtk theme, and icons, and Caspar David Friedrich’s Monk am See. Openbox with the Children of the Earth Openbox theme. I had written this a year ago, but somehow forgot to post it. But here are my screenshots from two years ago. As I’ve been doing for a few years now, I am posting screenshots of my desktops of the past year, to amuse you (nearly everyone likes to look at screenshots), to document my changing aesthetics, and to capture my mood of the year as reflected in these images. Below are the screenshots of the computers I’ve used in the past year. Aryaman is a Thinkpad 240 I bought on ebay for £10. I used it particularly when travelling, or when working in a library. I no longer use Mitra (my 11 year old Dell Inspiron 2500) and Yantra (my 10 year old Compaq Presario), but recently gave them away to others who found some good use for them. Loka is my old desktop. 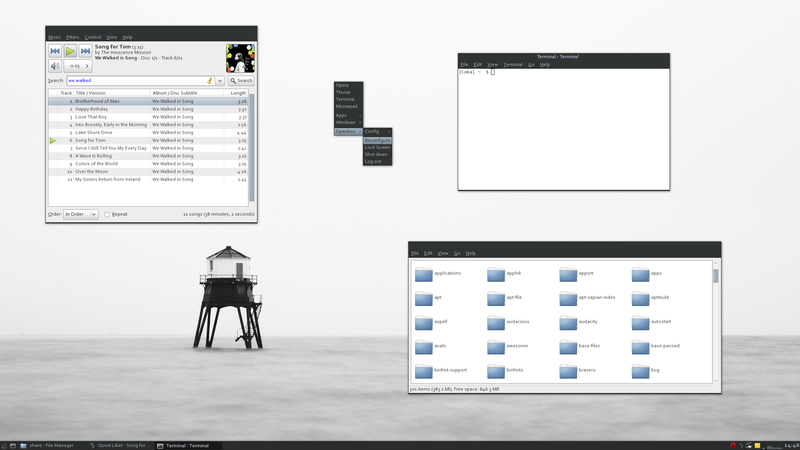 Openbox 3.4.10 in Xfce 4.6, with the Fearless Openbox theme, the Umbra Gtk theme, and the Iris icon theme. 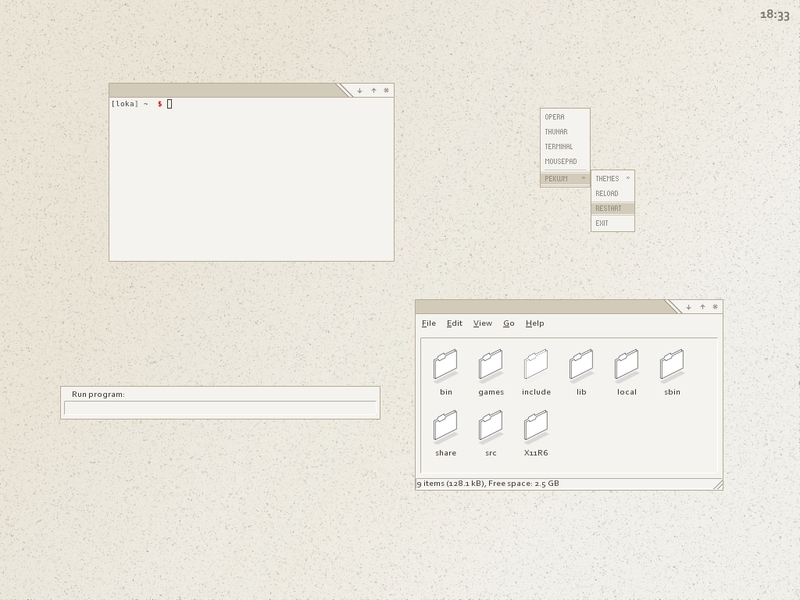 Pekwm 0.1.11, with the Elegance Pekwm and Gtk theme, and the Iris icon theme. 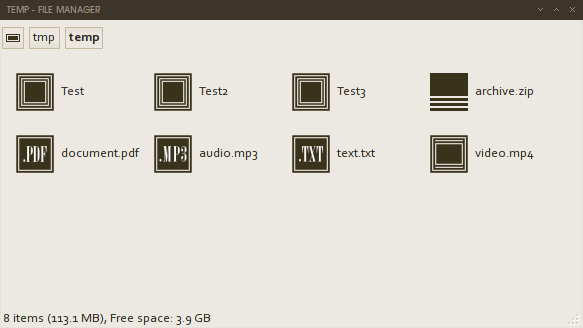 Pekwm 0.1.12, with an updated Groove Pekwm and Gtk theme, and the nuoveXT-1.7 icon theme. 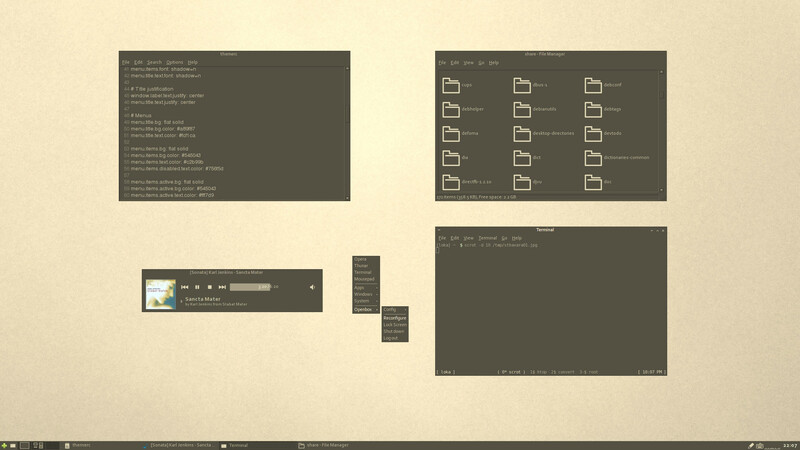 Pekwm 0.1.12, with the Groove Pekwm and Gtk theme. The icons are from the Any Colour You Like icon theme. 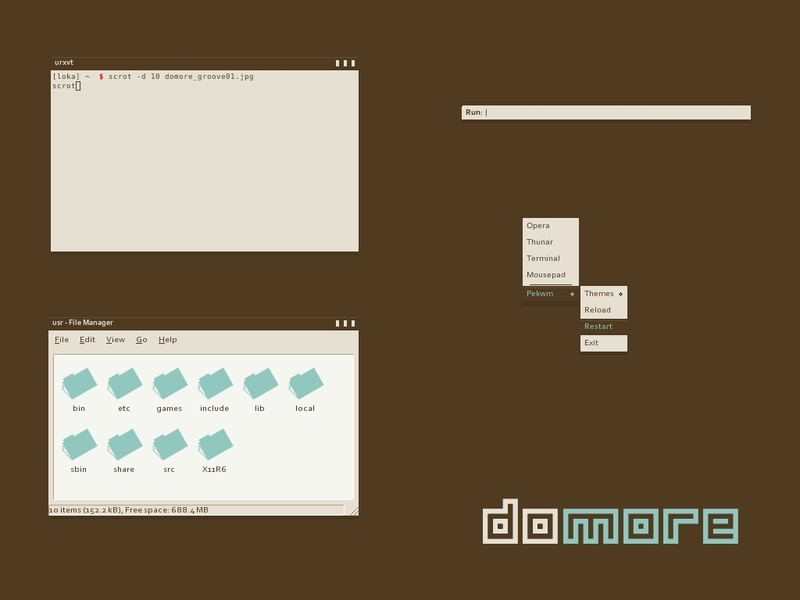 Pekwm 0.1.12, with the Groove Pekwm and Gtk theme. The wallpaper is home made. 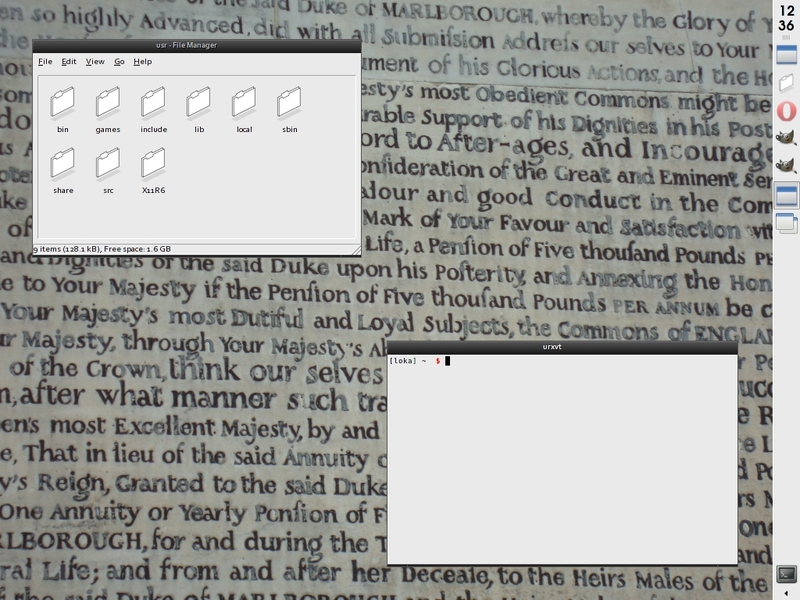 Openbox 3.4.10, with the Brume Openbox and Gtk theme. When I’m working on my computer, I often lose track of time. In itself I don’t mind this, but the downside is that I often am not aware of the different sandhyas, the different phases of the day (sunrise, noon and sunset) at which I should meditate on the Gayatri mantras I received at initiation. 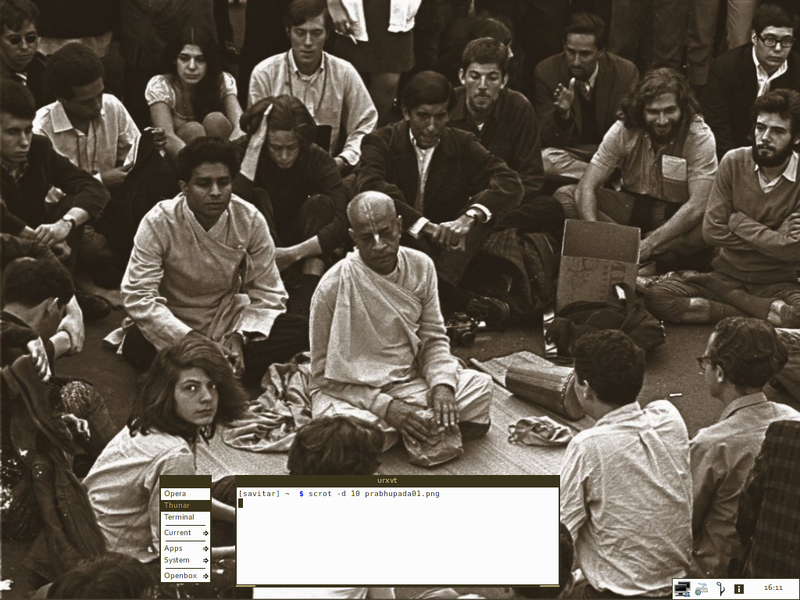 Luckily, with Linux it is very easy to have your computer remind you that it is nearly time to chant. 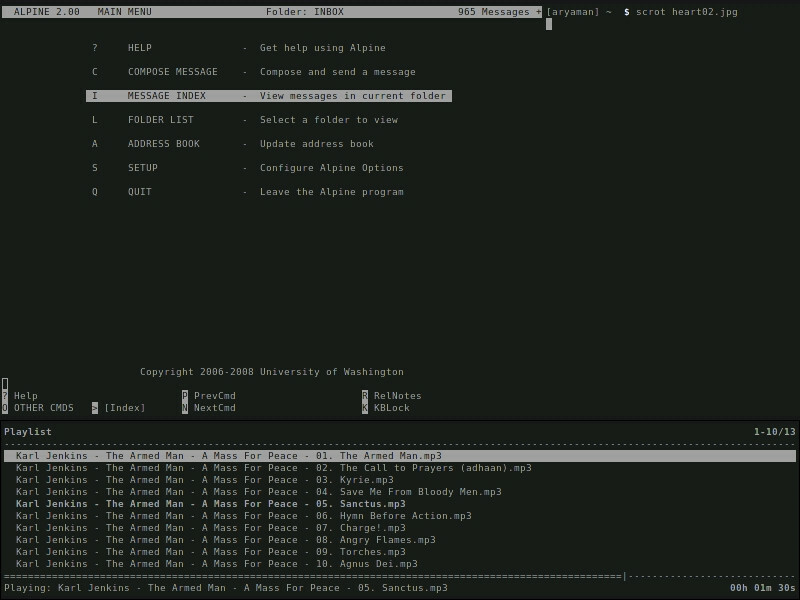 All you need is crontab and gxmessage. Crontab is part of the default installation of many distributions, and gxmessage is easily installed (. Here is how you would do it. If you click “Remind me later” the window will pop up again 10 minutes later; if you click “I’ll chant now” the message will simply close. You can change those settings (including the text that is displayed) by editing the script I gave above. This indicates the structure you need to use for crontab entries: for each entry you can specify the minute (0-59), the hour (0-23, 0 = midnight), the day of the month (1-31),the month (1-12), and the day of the week (0-6, 0 = Sunday), and finally the command you want to be executed at that time. 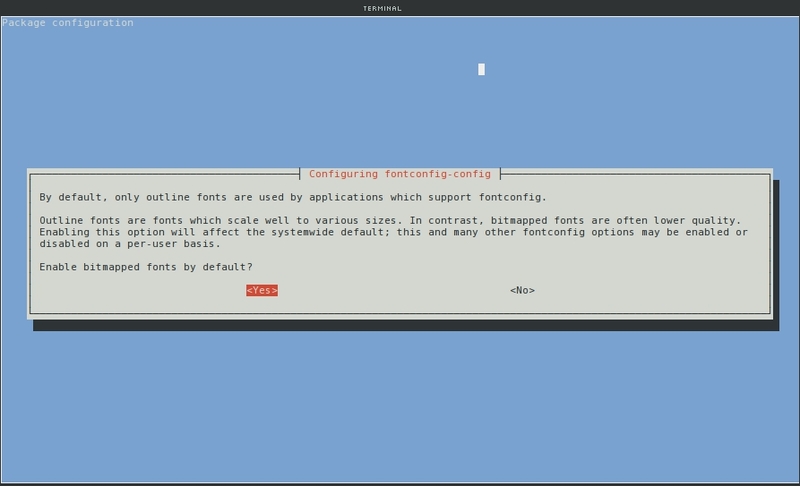 If you want to run a command every day of the month, or every day of the week, you can enter an asterisk (*) as the value to that setting.If you want to cron to launch an application with a graphical user interface, such as Gxmessage, you need to specify what screen to display it on with the command export DISPLAY=:0. If you only have a single screen, you need to use DISPLAY=:0; if you have more than one screen and would like the message to appear not on the first screen change the number accordingly (to :1 or :2). This will run the script every day of every month and every day of the week (the three *s) at 00 minutes past 12 and 18 hours. The command part of each line ( export DISPLAY=:0 && /home/USERNAME/.scripts/Gayatri_gmessage) specifies that the Gayatri_reminder script is to be run on the first screen. There are some obvious drawbacks to this system. If you want to be very strict and meditate on the Gayatri mantras at the exact sandhya times, this method is not very practical, unless you live close to the equator where the sunrise, sunset and when the sun reaches its zenith are nearly at the same time of day all year round. I started writing a script that took the exact sunset times into consideration, and had some success, but lost that script and can’t be bothered to rewrite it. Maybe I’ll revisit it in the future, but for now this system works fine. I’d rather chant my Gayatri mantras slightly off time, than forget them entirely.